Labour’s next leader must become a voice of organized labor or risk losing the support of a union that helped fund its last election campaign, Unite’s general secretary has said. Speaking to the BBC on Sunday, Unite chief Len McCluskey warned that Labour must choose the right leader to replace Ed Miliband. “It is the challenge of the Labour party to demonstrate that they are the voice of ordinary working people, that they are the voice of organized labor,” he said. 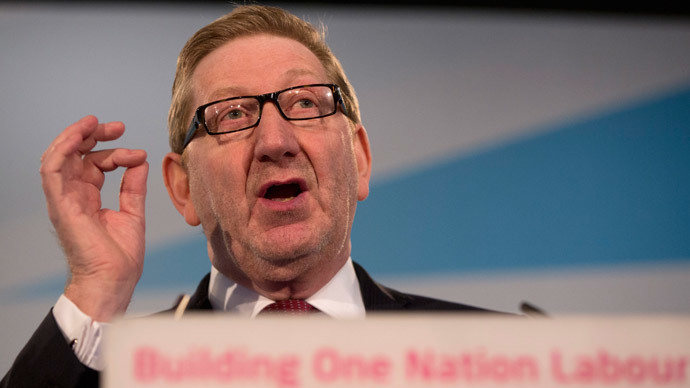 McCluskey hinted that the union might reconsider its historical links to Labour if the next leader doesn’t champion the workers from which the party takes its name. His comments come as the Labour leadership contest is heating up, with Andy Burnham the current frontrunner. Burnham, who is said to have spoken to McCluskey since Labour’s election loss, told the BBC: “This won’t be union bosses deciding, this will be school dinner ladies, this will be healthcare assistants. “I am the unifying candidate. I am bringing all parts of the Labour movement together,” he added. McCluskey has been consistently critical of Labour’s approach since the general election saw the party virtually wiped out in Scotland. He maintains the defeat didn’t occur because the party was too left-wing, but rather because its rhetoric on austerity was misguided and failed to offer real alternatives. In a Guardian article, published on Wednesday last week, he suggested fallen Labour leader Ed Miliband had proven a disappointment, arguing the party’s narratives on creating wealth became a smokescreen for abandoning society’s most vulnerable. Additionally, a group of MPs have written an open letter, published in the Morning Star newspaper on Saturday, calling for the next leader to take a radical approach.